Bicycling’s Chief Promotional Officer (CPO) Mikael Colville-Andersen has given a talk at TEDx Copenhagen today. He was an engaging and entertaining speaker. I’d never seen any talks given by him in the past. I had been looking forward to hearing what this learned individual had to say about bicycle promotion. Copenhagen is a bicycling haven and I knew that the talk would be given to a largely Danish audience. I thought this might put the ideas he presented outside the realm of my promotional agenda here in Waterloo. Still, I hoped for a nugget of wisdom that I could bring to my local area that would help grow cycling and make positive difference in my community. Then he spoke and boy, was I disappointed…. His choice of topic was ‘Why We Shouldn’t Bike with a Helmet’. In the cycling world, it’s a real topic and is hotly debated (honestly). Many cyclists, erring on the side of caution, happily wear helmets. Helmet detractors usually believe that helmets send the wrong message about the dangers of cycling. In his TEDx talk, Mikael goes as far as to point to helmet campaigns as promotion of a fear culture surrounding cycling. This culture of fear will keep people from adopting the bicycle as a reasonable mode of transport because they will be, well…. afraid. Maybe words have merit, maybe not. We’re not going to solve the helmet issue on Waterloo Bikes. I actually find his choice of topic a curious one. Outside Denmark (and Holland) there are so many bicycle transport issues that are far more important than helmet propaganda, real or imagined. I would have really appreciated hearing him address issues that I consider far more influential in preventing bicycle uptake. Issues like motorist education, safe bicycle infrastructure, local government policies and cyclist education. Am I being too hard on the guy? He was speaking in Denmark to a Danish audience using Danish statistics. However, the talk was broadcast all over the TEDx world. Obviously you know my stance on helmets. I think it’s quite warranted. If in the next provincial election a new premier puts in an all ages helmet law, the number of cyclists will fall drastically across Ontario (which is already slightly below the national average). It will fall more so here then it did in BC, and such few people ride in the Maritimes it’s not even worth mentioning. This then gives way to those who already claim bike lanes are a waste of money because no one uses them, even more reason to push their anti-bike lane agenda. He was bang on when it came to cars & helmets. Would people still drive as much as they do if driving was promoted as something dangerous, like cycling so often is? I can already tell you if any political party even hints at a helmet law in the upcoming election, I won’t even consider them…Even if they promised all cyclists the moon (aka dedicated bike lanes on every single road in the province). Ryan, thanks. I appreciate your stance on helmet laws. I understand the arguments and even agree with them partially. Anyone follows on, check out http://thecitycyclist.blogspot.com/search/label/NO%20to%20helmets for the skinny. I just don’t like putting my noggin on the line. Whether or not it’s actually riskier than standing on the sidewalk. I also would not want to see mandatory helmet laws. That’s too draconian IMO. I just thought there might be more pressing issues facing cycling today. At least in NA. If you had Harpers attention about cycling for 3 minutes. What would you say? Transportation issues usually aren’t national issues in Canada, unless it comes down to more federal funding. They tend to be more municipal and provincial issues. Just look at all the provincial funding Quebec has spent on La route verte. However if it came down to talking to Harper about cycling, I probably would be stumped. I feel I might need 3-minutes just to explain what a bike even is…Okay, that’s a bit harsh, but I really wouldn’t have a clue at what to talk to him about. He’s just not the “cycling type” and probably wouldn’t understand ‘our needs’. Provincially speaking (McGuinty) I’d discuss a possible tax break (or some sort of break) for cities who install & maintain PROPER cycle paths. Not just a strip of white paint, but real separate bike lanes. I don’t really view costs as being an issue any more. If we are to get more people on bikes, you have to build and maintain them. Denmark has one of the highest qualities of life, yet are the highest taxed. They actually receive things in return for their tax dollars. Plus, we never bat an eyelash at the ridiculous amount of money spent on a few kilometres of highways. With the possibility of Hudak getting in next October, I have my concerns. There tends to be less interest in putting forth meaningful laws or investment when it comes to cycling from the Conservatives, though in credit to the previous Conservative government in Ontario (Harris I believe), they scrapped the all ages helmet law that the then NDP were going to put through. Since the current Ontario Conservatives have yet to get back to me (twice) on their stance on all age helmet laws, that would be what I would discuss with Hudak, should he get in. If his answer is a quick no, then I would talk about the same thing as I would with McGuinty. As a newbie to the bicycle blogosphere I too am frustrated with all the angst against helmets. I wear one as I’m convinced it’s common sense. I’ve crushed two helmet’s in my lifetime and they both saved me from serious head trama (although the one did break my nose, that’s a separate post). I believe science backs up helmet use as well, you just have to listen to doctors from children’s hospitals discuss the merits of head protection. It’s common sense. I agree that helmet use should not be legislated for all ages and that if it is, it will hamper access to biking as a form of transportation. Rob, I echo your call to focus on issues that are more important. Focusing on helmets just makes cyclists appear as fringe fanatics and our voice diminishes on larger issues of creating sustainable, livable communities. It’s kind of funny because I usually believed helmets made more sense for people who go faster on bikes (30 km/h or faster), yet they are usually ineffective as they are designed for low impact crashes of about 20 km/h or less. When I did wear a helmet I just felt always on edge, as it seemed people passed closer, which as it turned out a few years later a Brit did a study proving this. Since I’ve been cycling without a helmet (5 or 6 years now), I’ve only had one vehicle pass me extremely close, and have fallen off my bike numerous times all because of idiotic riding by myself. Now I haven’t fallen off in over two years, and every time I did fall off it was my fault. Riding on ice too fast or just doing something stupid. I always had more then enough time to brace myself for a fall mind you, and the worst injury suffered my a bruise on my leg from my bike landing on it. For me I’ve never ridden fast. I use to top out at 30 km/h. Over the past year or so I’ve changed my riding habits so that I average 15-20 km/h. I prefer slower cycling now. If wearing a helmet is going to get someone on a bike, then I say great! If not wearing one is going to get more riding, again, great! The scientific evidence for helmets is quite conclusive; they will not save your life. In the UK helmet manfacturers are forbidden from claiming that in their promotional material because it’s not true. The best they can do is mitigate brain injury. You’re new to cycling by your own admission. 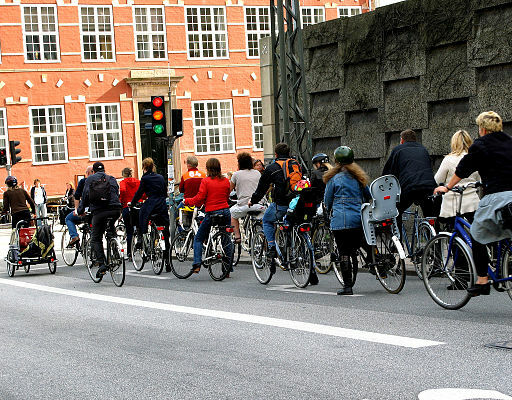 Look to where cycling is a normal, everyday activity like Copenhagen and you’ll find very little helmet use, yet these are the countries where road use for all modes of transport are the safest. Helmets do not help safety, you just have to look at Australia for that. The most important thing to concentrate on to get people cycling is to market it as easy, convenient and normal. Promoting helmets is the antithesis of that. I for one am of the opinion that you can do as you please with your own noggin. I choose to wear a helmet to protect mine, but I won’t try to convince others to do so. When it comes to laws, I find the Conservative party to err on the side of individual freedom, most of the time, which is why they are usually a safe bet when it comes to stuff like this. On the other hand, they also give the people what they want, which is more car infrastructure. Seems fair enough to me, but if their attitude towards bikes and bikers improved, they might get more votes. Now to the actual content of Rob’s post and his beef, there are much bigger issues facing the cycling community, and to focus a whole speech on helmets seems like a waste of time. Not to mention that the audience was largely Danish, so most of them probably don’t wear helmets anyways. Seems like a feel good, rah-rah, kind of speech to rally the troops and to convince them that protecting your head is a bad idea. I really don’t see why this is different from the seatbelt issue. I suppose there are people that still insist seatbelts aren’t worth it because they are uncomfortable, or restrict their freedom, and there are some that insist if they’re in a bad enough collision a seatbelt isn’t going to save them (maybe it will slow their exit if the car is going to explode?). But most of us have gotten used to the idea that it can increase safety in many cases, and so it’s worth the hassle. As an avid cyclists, I’ve never had a case where I’ve nearly been hit head on or t-boned at high speed, but there have been plenty of cases when I’ve nearly been sideswiped, pushed off the road, or clipped, usually at relatively low speeds, which would have pushed me to the ground. The only times I’ve actually fallen off my bike have been my own fault or the fault of the road/environment/weather. I can’t imagine my experience is unrepresentative, and it’s these low speed collisions and accidents not involving cars where helmets have proven to be most useful. I’m not sure about a helmet law. I agree that the #1 best way to increase cycling safety is to have more cyclists on the road, and that if a helmet law decreases the number of cyclists, it does a disservice to us all. On the other hand, I’m not sure it would. The law came into effect in BC when I was in highschool, and I don’t think it had a particularly negative effect on cycling. I’ve never seen any evidence to suggest it did. And certainly, there was no lasting effect – a trip to Vancouver is all you need to prove that. @Ryan suggests it would fall more sharply here than in Vancouver, but I can’t see why. I don’t believe for a second that people in Ontario are substantially more vain or more “freedom loving” than people in BC. Seatbelts don’t prevent head injuries. I’ve heard of people who still bang their heads on the steering wheel or head rest and have mild to severe head injuries. I’ve only been in a car twice in the past 5 years and both times I didn’t wear a seatbelt. I didn’t feel any less secure, of course they were both relatively short distances. In Nova Scotia cycle rates fell between 40-60% after an all ages helmet law was put in. Helmet laws all but killed the bicycle in Australia as a means of transport. Melbourne’s bike share is suffering greatly because of helmet laws. Not wearing a helmet has nothing to do with being vain (a common misconception), it’s about who should be wearing a helmet. Most statistics point to pedestrians and motorists being the more logical group to warrant a helmet law. Cycling is one of the safest ways to get around, while driving is consider the most dangerous (at least in the USA). Just going back to Vancouver, there are still a number of people who ride without helmets there. Many of those who wear helmets in Vancouver also encourage “special cycling clothes” such as reflective jackets, which you also see a lot of there. The attitude towards cycling in BC compared to Ontario/Quebec is like night and day IMO. I don’t see how that is relevant. My point is that people were opposed to seatbelts at first, but have gotten used to them, and make the “sacrifice” of discomfort because of the realistic benefits for safety. The fact that you didn’t wear a seatbelt twice in two years and didn’t feel less secure (or die) is also totally irrelevant. George Burns smoked cigars his whole life and didn’t get cancer, but that doesn’t mean they aren’t dangerous. Yes, there are less cycling related head injuries than car related head injuries, but there are a heck of a lot more car accidents than bike accidents. The Toronto Coroner’s report suggests that 55% of cycling fatalities over a 10 year period were from head injuries. Admittedly, the report specifically mentions that it is unclear if these head injuries could have been prevented by helmets, but considering the large number of injuries that resulted from sideswipes (the time when, logically, a helmet would be most useful), I’d say it’s quite likely. As for rate of use, it’s not impossible that a helmet law would dissuade people from cycling for a time, but I’m not convinced it would be a lasting effect. Your article about Melbourne demonstrates that helmet laws have a very negative effect on bike sharing schemes. I’ll concede that point — since the bikes aren’t rented with helmets, it’s not super enticing to bring your helmet along everywhere you go, just in case you feel like renting a bike, and makes rentals by tourists unlikely. Well, what is it then? The only other negative I can imagine is that it somehow convinces people that cycling is dangerous, but that’s problematic for two reasons. First, I think most people already think cycling in Ontario is dangerous – that’s why a lot of people don’t bike in urban areas, or allow their children to bike to school. Secondly, by the same argument, you could equally argue that installing bike lanes makes people think that cycling anywhere without bike lanes is dangerous, and thus dissuade them from cycling. Since Waterloo doesn’t have a complete network of bike lanes (none on King, for instance), do the ones one other streets dissuade people from cycling? As I thought I made clear, I’m not convinced that helmet laws ARE a good idea either, but I’ve heard all your arguments before, and I don’t think they prove anything conclusively. I choose to wear a helmet (and a seatbelt) because I think the inconvenience is worth it for my safety. For the moment, you don’t have to do the same – more power to you. Helmets are different from seat belts because there is evidence that seat belts work and work quite well. The same cannot be said for helmets. They are not comparable. That’s nonsense. You’re suggesting that if you fall off your bike at a low speed and hit your head, you’re not more likely to get hurt if you aren’t wearing a helmet? This is common sense. Statistics don’t prove that it decreases the chance of head injury from all accidents, but it’s pretty hard to collect statistics on that, as Ryan has ably demonstrated, because you would need a closed system where all other factors (cycling infrastructure, number of riders, amount of traffic, etc) remain the same. There was great difficulty in proving that seatbelts “work” before they were made mandatory as well. Look up Ralph Nader sometime. There was great difficulty in proving that seatbelts “work” before they were made mandatory as well. (Nor are they mandatory everywhere even now.) Look up Ralph Nader sometime. @ Joey Jo-Jo: no it’s not nonsense. We’ve had helmet compulsion in Australia for the last twenty years with roughly 80% compliance. The effect on head injury rates has been nil. That’s empirical fact. I looked at that page (which is hardly neutral) before I posted, but I don’t think your stats are conclusive because it doesn’t make any logical sense. I don’t how you can argue that without arguing that helmets (of any kind) are not helpful. Are you actually suggesting that if I were to knock you off a bike, you wouldn’t rather have a helmet on? What about off a motorcycle? Playing hockey? etc? If I may, I think that many anti-helmet (this moniker may not be accurate) folks will not argue about helmets being safe in individual cases. There’s always a specific scenario where you’d rather be wearing one. It’s generally about whether helmet campaigns, or laws are the best thing for cycling as a whole. Most are anti compulsion. Most couldn’t give two hoots whether you choose to wear one or not, it’s about choice. There is no data supporting that society is better off with helmet compulsion. If helmet compulsion does discourage cycling, as many people believe is true, then mandatory helmet laws (MHLs) harm cycling and by extension, society. Like Euan said it’s more anti-law/compulsion. I strongly believe that laws are terrible for cycling. Helmet campaigns don’t help either however for another reason. When people start to read things such as helmets will help prevent head injuries or save you in a crash, the words injuries and crash I believe is a turn off as it sounds dangerous. Great to see a healthy debate on the topic though. Both sides are usually passionate! I’m fully okay with that. I am certainly not convinced that mandatory bicycle helmets are better for cycling or for society as a whole. I am convinced that the are a benefit in the case of many cycling accidents. How to weigh one against the other is certainly worthy of debate. Do seatbelts make driving any safer? Are fewer people dying because they are mandated to wear them? If the only argument for helmets is because people made the “sacrifice” of discomfort for seatbelts, why don’t motorists make the sacrifice and wear motoring helmets as well? I can already tell you the out cry would be incredible. Same would apply for pedestrians. In the cases where people weren’t wearing a helmet and were killed, most “experts” even admit that they are unsure a helmet would have made a difference. With Ontario’s cycling rate just below the national average and Ontario having a low rate of helmet use in most cities, I truly don’t see cycling recovering over time. If it did, the reason would be lack of enforcement by the police. Our regional police force here never ticket parents of kids who ride helmetless. It’s not worth their while (them admitting this a few years ago on radio). McGill’s health centre wanted BIXI to provide helmets. Reason they didn’t bother? –“Stationnement de Montréal looked into providing helmets with Bixi cycles, but determined it just wasn’t possible, said Alain Ayotte, the agency’s executive vice-president. To make sure the helmets were adjusted properly to each person’s head, the Bixi system would require staff at stations across the city to check the helmets before people rode away, and they would have to confirm they hadn’t been damaged by being dropped on the pavement, for example, he said. I know I wouldn’t want to wear a helmet worn by someone else. As for the vain issue? Other then the fact they do show that cycling as being dangerous, they are completely uncomfortable, and when I did wear one I developed headaches within minutes. They are much heavier than a tuque or hat. When I was out yesterday my ears would have froze off had I not been wearing a tuque. You could also argue that if bike lanes on some streets but not all makes it seem dangerous, then you could equally say walking is dangerous because not every street has a side walk. It’s about providing space for each transportation need. I’m aware that many who wear helmets are against making it law and I’m indifferent if people do wear them. I however will provide the “other side” so long as people promote helmet use with stats that are inconclusive and based on a perceived notion that wearing a helmet must be safe. Wearing full body armour with bubble wrap would make people even more safe from broke bones. That’s not the only argument, it’s just a comparison. Of course, pedestrians and motorists could wear helmets, and in my opinion, it would make them safer. I believe racecar drivers do wear helmets. I suppose the reason against it would be inconvenience and discomfort balanced against the risk. For me, personally, I find the inconvenience/discomfort of wearing a seatbelt worth the safety it provides. At the time seatbelt laws were passed, a lot of people did not consider that a good trade off – now I think most do. Personally, I find wearing a bike helmet worth it relative to the safety benefits to me – others do not: fine. I can’t actually prove that it is worth the relative benefits to society, which is why I’m undecided about a mandatory helmet law. But I haven’t seen evidence that it isn’t worth the safety benefit either. I just don’t think “I don’t feel it’s personally worth the safety benefit” is an reasonable reason to decide one way or another – I don’t think there’s enough evidence to argue strongly either way. I certainly don’t have an answer to you on the BIXI case. Were helmet laws made mandatory, it would almost definitely have a negative effect on BIXI-type setups. I think the Melbourne case proves that pretty effectively. I’m not sure, however, that BIXI alone is enough reason to decide to oppose helmet laws. I’m sorry that wearing a helmet gives you a headache. I’ve actually never heard that before. I get headaches pretty easily, but I’ve never got one from wearing a helmet. I also wear a nice thin cycling tuque that fits under my helmet and keeps my ears nice and warm. I actually don’t think we’re so far apart in our arguments. We’re just at slightly different points on the spectrum of balance between safety and convenience/comfort. It depends on how you land. Helmets have never been tested for side impacts. Only landing on the top of your head, which if your were to land directly on the top of your head, I’d be equally worried about breaking my neck. Again, any time I have fallen off at low speeds I have had more then enough time to brace myself for the fall, not even coming close to hitting my head. Really? They’ve never been tested for side impacts? That’s surprising, but I suppose it’s possible. Seems rather odd that they would be used in various sports where it’s equally (or even more) unlikely to land on your head. But really, if that’s the case, I’ll concede that they haven’t been proven effective for cyclists. To me, it still makes logical sense that the would be effective, but I don’t know for sure. For the record, I’ve only heard this limitation on side testing from one source. Not sure if Ryan has better information.